The concept of this painting dates back to 1872, when the Russian artist decided to create a cycle of paintings, united by a common theme – the depiction of the harsh northern nature. The first two pictures of the cycle – “Ladoga Lake” and “On the Island of Valaam” – were created by Kuinji, who was impressed by the trip to the harsh lands. Against the background of these masterpieces, written six years later, the “North” looks like a final accent, without which the cycle was perceived as incomplete. Apparently, Kuindzhi was aware of this and therefore, for his last canvas, he picked up a name that does not contain geo-referencing. The painting is an image of an endless plain stretching into the distance, which the artist offers to observe from a bird’s eye view. In the foreground we see several lonely pines – a well-known motif that recalls Lermontov’s verses from the school bench. In the distance, they twinkle – they twinkle, another verb cannot be picked up – the endless forests that appear and disappear again in the wrong fog. They can create a sense of a certain secret, which is not so easily revealed to the questioning viewer. The lion’s share of the canvas is occupied by the image of a gray sky, thus Kuindzhi pays tribute to the perennial theme – the confrontation of two elements. The artist poetizes the northern nature, demonstrating his own attitude towards her: the canvas is imbued with love for the harsh edges. At the same time, this feeling is mixed with a sense of grandeur, of the power of nature to man. Like previous canvases, “North” is stored in the Tretyakov Gallery. 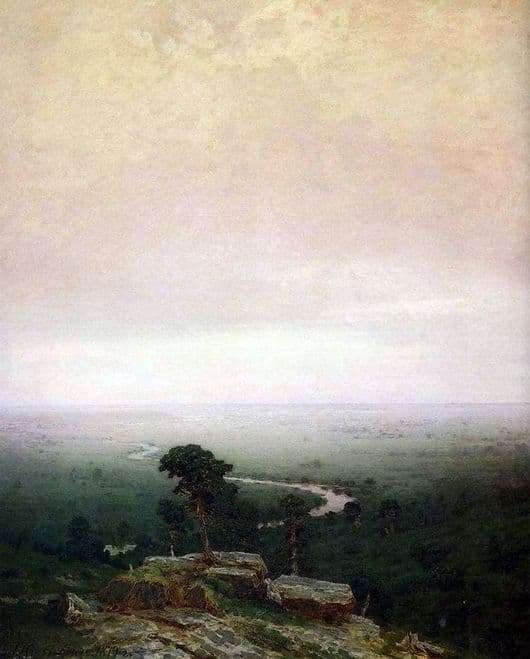 It is no coincidence that it is sometimes called the final canvas of the artist, because after its creation, as is well known, Kuindzhi departed from the description of the northern nature. For a long time, it will be captured by the south of Russia, but this is a completely different story.